About "BIOTA Southern Africa – The Collection of Lichens at the Botanische Staatssammlung München"
The BIOTA Southern Africa Collection of Lichens is stored at the Lichen Collection of the Botanische Staatssammlung München (M) and comprises more than 1,700 herbarium specimens from Namibia and the Republic of South Africa. The specimens were collected during the period 2001–2009 by Dr. Luciana Zedda, Dr. Matthias Schultz, Anne Johann and Jürgen Kreyling in the framework of the BIOTA Africa project. The BIOTA Collection of Lichens (including some lichenicolous fungi) at M includes type material (i.e. isotypes of Siphula flavovirens Kantvilas, Zedda & Elix and Zwackhiomyces namibiensis Diederich & M. Schultz), and covers more than 260 taxa, most of them have been recorded for the first time from the study area. Duplicates of these specimens will be stored at the Pretoria National Herbarium (PRE), the National Botanical Research Institute of Namibia (NBRI) and the Herbarium Hamburgense (HBG). 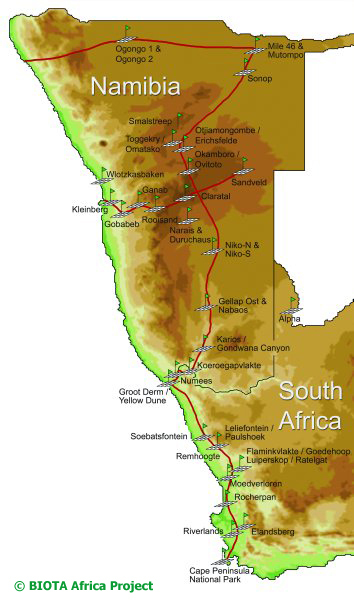 The data project "BIOTA Southern Africa – The Collection of Lichens at M" was established by Prof. Dr. Gerhard Rambold and Dr. Luciana Zedda in 2001 with technical assistance by Dieter Neubacher. The specimen information was digitized both as images and as a structured database. "BIOTA Southern Africa – The Collection of Lichens at M" uses Diversity Workbench components. The taxonomy and nomenclature follows LIAS names. The ColdFusion webinterface was programmed by Jan Ingenhaag, Staatliche Naturwissenschaftliche Sammlungen Bayerns, IT Center. The Generic Point Mapper and Google Maps are used as web services to create dynamic maps. As an additional service, the lichen name given in the query result is directly linked with the respective data record in LIAS names to provide taxonomical information on the lichen taxon concerned. Currently the data project "BIOTA Southern Africa – The Collection of Lichens at M" is maintained and expanded by staff members of the Botanische Staatssammlung München. Notices of errors of any kind are much appreciated by the editorial staff here. Technical support is provided by the SNSB IT Center. The Database "BIOTA Southern Africa – The Collection of Lichens at M" and – if not stated otherwise – its supporting files have been copyrighted: © BIOTA Southern Africa and University of Bayreuth, Department of Mycology and Lichenology, 2010–2019. The Federal Ministry of Education and Research (BMBF) granted support in the context of the BIOTA Africa project. Permission is given for free use of data in the search result for non-commercial purposes; any commercial use must be granted by prior written agreement. © BIOTA Southern Africa and University of Bayreuth, Department of Mycology and Lichenology 2010–2019. All rights reserved.